It's delightful to get a newly released iPhone XS, XS Max or XR, capturing images with the more advanced camera, and watching videos with the best and biggest displays. If you are a music lover, you must be wondering how to add music to your new iPhone. Ideally, you can take the assistance of iTunes or any third-party tool to add music to iPhone, or copy music to iPhone. In this article, we will list the best three methods on how to put music on iPhone XS/ XR when it's a blank device at the very beginning. Each way has its upsides and downsides but you can choose the best one that suits your needs. If you have been using an iOS device for a while, then you must be familiar with iTunes as well. It is developed by Apple and is known as the official solution to manage the contents on your iPhone and iPad, including music, TV shows, movies, and more. Though, you might find the process of learning how to add music to iPhone using iTunes a bit complicated, it's quite good for keeping your data if you regularly back up your iPhone with iTunes. Step 1:Connect your iPhone XS/XR to your computer with its USB cable. Step 2: Make sure you have installed the latest iTunes version and launch it. 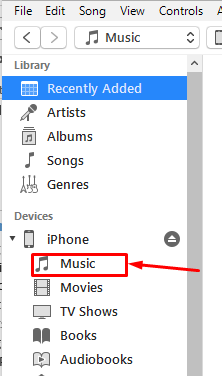 Step 3: Choose the music files you want to add to the iPhone XS/XR and drag the music contents to the iPhone XS/XR device in the left sidebar. Step 4: Check the added music files in the Music app on the iPhone XS/XR. Syncing your iTunes music to iPhone with iTunes is quite complicated and time-consuming, especially for iPhone newbies. Also, we have to take the risk of data loss on our device, as iTunes will require to remove all existing media files. In order to easily, safely and rapidly transfer music from PC to iPhone without iTunes, you can try Syncios Data Transfer, an excellent Apple synchronization program. SynciOS Data Transfer software not only easily imports music from your computer to your iPhone, but also converts your songs to music formats supported by your iPhone. Additionally, Syncios Data Transfer is an all in one software that can help you move your data to your new phone, including music, video, photos, apps, notes, bookmarks, contacts, text messages, imessages, call logs, safari history and whatsapp messages. You can simultaneously connect your old and new phone and copy the data with a single click. The program supports both Android and iOS devices. Here we'll show you how to easily transfer iTunes music to your new iPhone devices with SynciOS. Step 1: Launch Syncios Data Transfer and Connect iPhone to PC. Firstly, you need to download and install Syncios Data Transfer on PC/Mac from Syncios official website. Tip 1: Although you don't need to use iTunes during the transfer process, it's necessary for you to install iTunes on your computer to help Syncios program identify your iOS device and access its data, which is the first step to make data transfer possible. Then launch SynciOS program, plug your iPhone XS to computer with USB cable. When a notification pops up on your iPhone asking you whether to trust this computer, tap on Trust to continue. Step 2: Select the iTunes Music You Want to Transfer. After the successful connection, choose Restore mode. And click on iTunes Library to load data of iTunes Library. Click on Next to continue. Select music and transfer then to your iPhone XS. 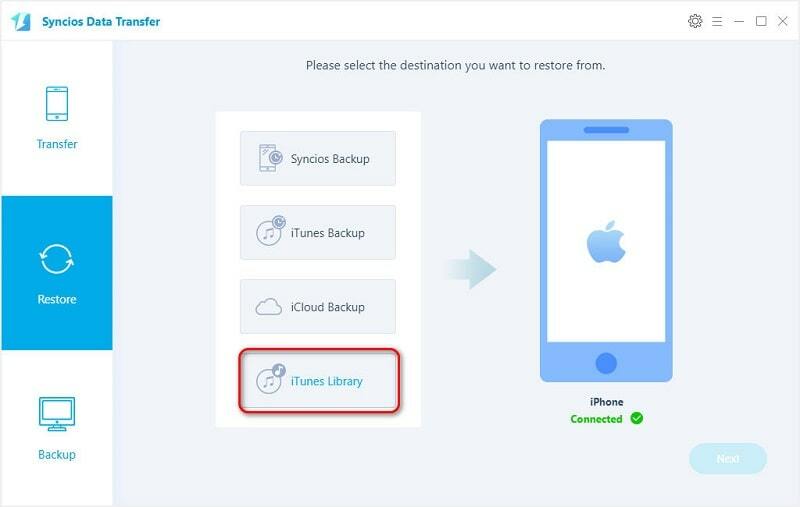 Tip 2: if you still don't understand what to do, these steps could be simplified to open Syncios Data Transfer > connect iPhone XS to PC > click on Restore > iTunes Library > Next > start transferring. 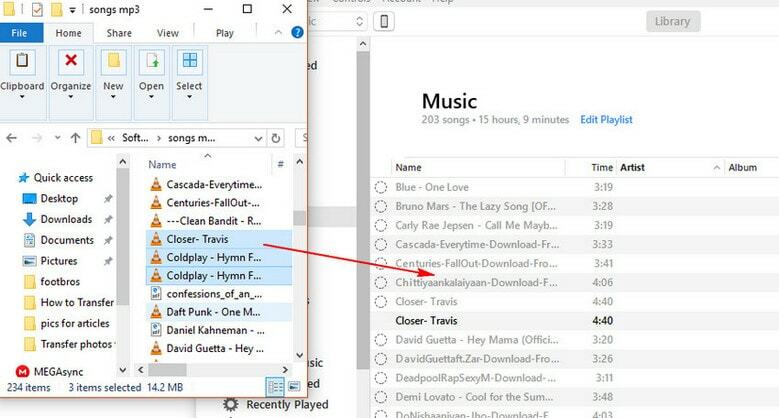 Now, your iTunes playlists are transferred from PC to iPhone XS/ XR in only 2 steps. If you have subscribed to Apple Music or purchased many iTunes music/ Audiobooks from iTunes Store, it is not an easy job to transfer them to iPhone XS or XR via the above menthods as Apple Music files and some muisic files purchased from iTunes come with DRM protection. In the following guide, we would recommend you another method to put music from iTunes to iPhone XS/ XR for enjoying. 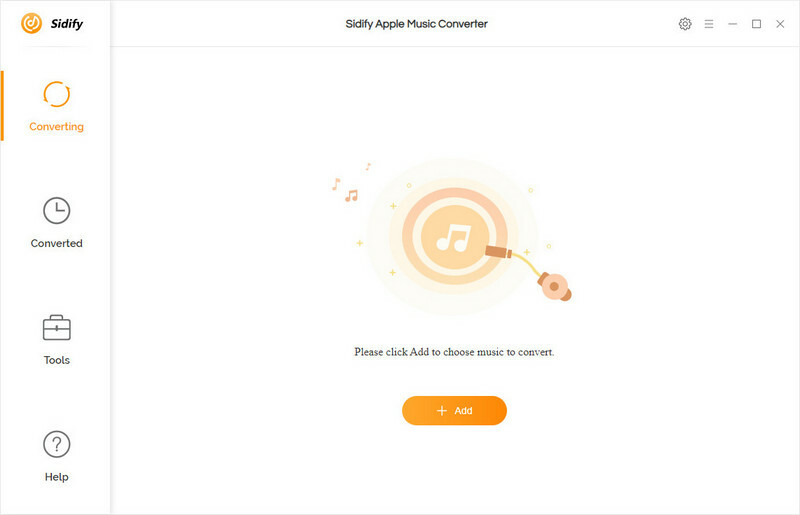 Now, here comes the perfect solution to put iTunes music and Apple Music to iPhone XS/ XR, that is by using the Sidify Apple Music Converter to convert Apple Music to plain format on Mac/ Windows and then move files from PC to computer. In this way, you can enjoy and keep all Apple Music files on computer or phone without burning mobile data and subscription fees. With this software (available for both Windows PC and Mac), you can convert the Apple Music music and iTunes music into plain MP3 audio format or other plain audio files at great audio quality, as well as removing DRM from some DRM-protected files. Thus you can to transfer all iTunes music files from your computer to your new iOS phones, Android phones and other MP3 devices for streaming without any restrictions. The user interface of the Sidify Apple Music Converter is very user-friendly. To strip off DRM from Apple Music tracks, just follow the below steps. 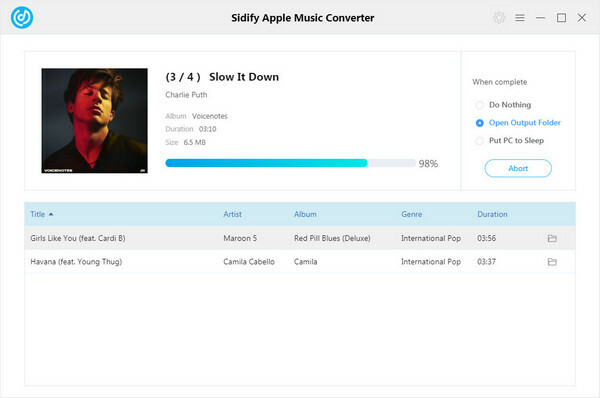 Launch Sidify Apple Music Converter and click "+" on the main interface, all your downloaded Apple Music and iTunes music files will show out as below. Apple Music tracks that you want to convert. Do so and it’ll give you your familiar iTunes organization in its own window. 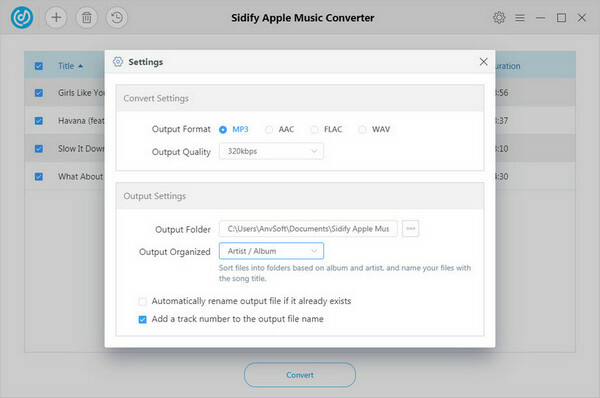 Tip 3: Sidify Apple Music Converter supports converting all your playable music on iTunes, including iTunes M4P music, Apple Music, iTunes M4A, M4B and Audible AA, AAX audiobooks to plain MP3, AAC, FLAC or WAV format. Clicking the setting button on the top right of Sidify interface, a new window would pop up. Here you can choose output format as MP3, M4A, WAV, FLAC, and adjust the output quality up to 320 Kbps. Besides, the output path is also changeable if required. Once all the files are added to the queue and all the settings are made, go ahead and click on the “Convert” button. After conversion, you can click button in the top left corner to easily find the well-downloaded MP3/AAC/FLAC/WAV file. Now, you can connect a USB cable with your computer and sync these DRM-free music files to iPhone XS/ XR. Then you can play these music files on your new iPhone through any MP3 players also without any restrictions. As you can see from above, Syncios can be the most time-saving and labor-saving way to sync music from iTunes to iPhone XS/ XR, especially for those users who just got a new iPhone. 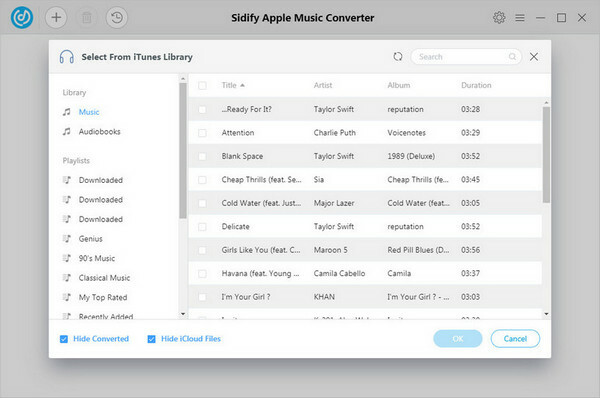 While the most cost-effective option should be Sidify Apple Music Converter as you can use this program to keep your Apple Music and iTunes music forever and play them anytime and anywhere. So, don’t hesitate to have to try now, and then use it to transfer music and other files from iTunes to iPhone with great ease.